Although it lasted about as long as its namesake on the beach, The Wave had a big place in Starrett's literary career. The late 1890s to the 1920s was a dramatic time in Chicago, as the city’s arts and culture scene exploded and came to rival New York. The Chicago Renascence (as Starrett spelled it) was a great time to be a writer and Vincent Starrett’s talents flourished during the period, even as he reveled in the flapper-era high spirits. 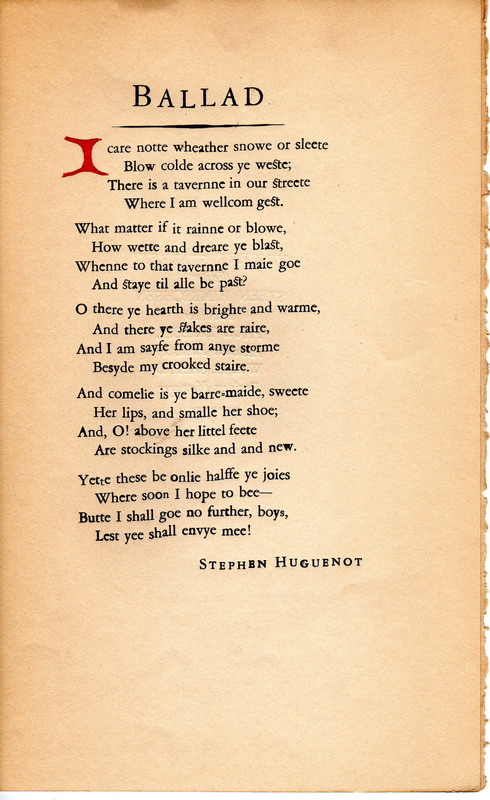 Prior to The Wave, Starrett had been a contributor to several other little literary magazines, most particularly The Double Dealer (1921-1926). The Double Dealer was based in New Orleans and looks like the Cajun answer to London’s infamous The Yellow Book, which had a brief but influential life from 1894 to 1897. Starrett’s occasional “Chicago Letter” in The Double Dealer leant an urban tint to the largely southern palette of contributors. His column was gossipy and bookish, as you would expect. Here’s an excerpt from the August-September 1921 number. Oscar Williams, the poet, has come to live in Chicago, and is at present happily employed in Kroch’s International Bookstore. He is slight and slim. His hair has a permanent wave. He wears spectacles. He is very young. He writes excellent poetry. He argues ferociously. He does not like chop suey. His favorite contemporary is John Masefield. He passes his Sunday afternoons with the Bookfellows. (NOTE: As did Starrett.) He smokes cigarettes. He admires the stars. He has published in The Double Dealer. Those familiar with Starrett's "Books Alive" newspaper column will recognize this as a precursor to that long-running Chicago feature. 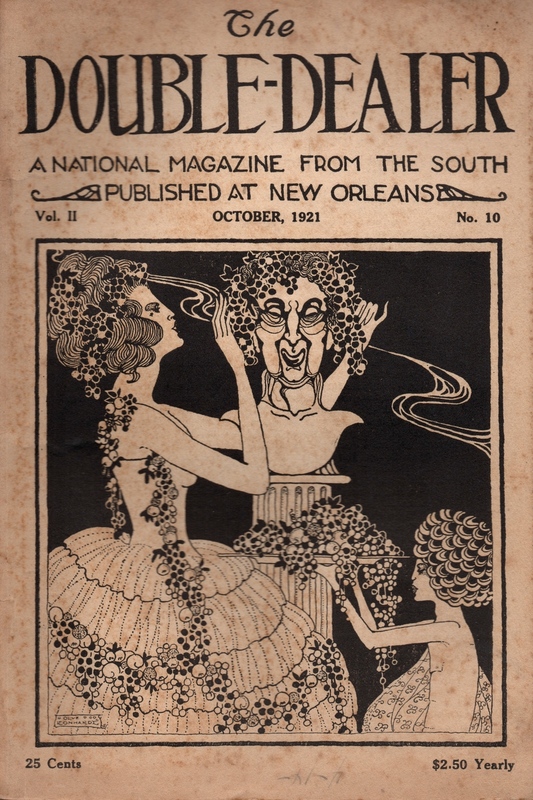 A few years later, Starrett had his own turn at producing a little literary magazine. Here’s how it came about. Starrett began asking his Chicago writer friends for contributions. He also went rummaging through the ephemera of his collection for rare and unpublished bits and pieces. It should be pointed out that while Starrett is known as a major Sherlockian collector, his interests and bibliophilic obsessions were far ranging. In other words, he had a lot of material to draw from. The verse which gave rise to the name of Starrett and Hinrichsen's little magazine. the second with a roar. The bohemian nature of his new Danish friends had its influence on the magazine’s editorial policy. Starrett discussed the policy, such as it was, in the first issue's editorial column, which he called "Demi-Tasse:"
Much of the delight came from Starrett's ability to print anything he wanted. For example, Starrett had an opportunity to publish the work of his hero, Arthur Machen, prose by friends like Ben Hecht and Carl Van Vechten, and poetry by several other friends. When there was space—which was often, since contributions were few—Starrett's own book collection offered up rare items regarding Oscar Wilde, Rudyard Kipling and Victor Hugo. Starrett loved being editor of The Wave. Here is a rare copy of Gene Markey's illustration of Starrett holding a copy of the magazine, with a note by Starrett. A sign of just how delighted Starrett was to be editor of The Wave can be seen in the caricature by Chicago illustrator and writer Gene Markey. (Markey produced two books of Chicago caricatures, and Starrett was in both.) This image is from Literary Lights: A Book of Caricatures, published in 1923 by Alfred A Knopf of New York. Starrett is shown as a Victorian era dandy: top hat, waistcoat and gloves. A pocket watch with a tiny "VS" etched in it, is dangling from a ribbon. 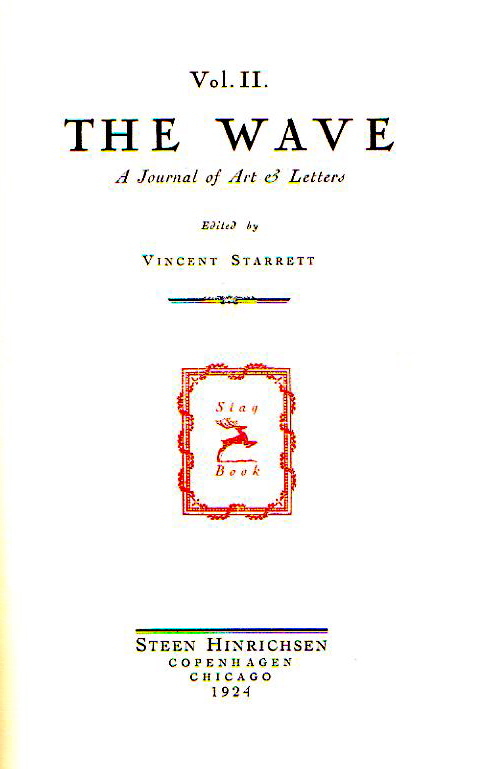 Starrett is also carrying a copy of The Wave. Entitled "An Eminent Victorian," Markey says under the image: "Vincent Starrett: 'What is the wild Wave saying?' "
"The wild Wave is saying, "This is a hell of a portrait!" Markey's caricature is a sign that, for a short time as least, Starrett was intimately associated with his his little literary magazine, The Wave. Starrett notes newspaper editors had fun with the name of The Wave when announcing the magazine's first publication. And there does seem to have been some genuine excitement from some editors, including The New York Times' Current Magazines column. Heralding a new magazine is always a pleasure. Therefore let the open hand be extended to The Wave, published by Henrichsen & Lunoe, 2103 North Halsted Street, Chicago, and edited by Vincent Starrett. It bids fair to be an interesting periodical of a distinctly modern tinge. The Contents page for the February 1922 number of The Wave. No matter how delightful this welcome, the ugly realities of publishing a literary magazine soon came into play. Hinrichsen was a talented artist and printer, but no better businessman than Starrett, who recalls one particular example. The headaches piled up. For example, the paper used for the magazine was fragile and began to fray even when fresh. (Indeed, although I own three issues, they are in such tenuous condition that I am reluctant to hold them forcibly open to be photographed.) The low number of subscribers coupled with the poor paper means there are very few copies around today. Individual issues can go for as much as $125, when they can be found. The final nail came when Hinrichsen and his family (Starrett doesn’t mention whether this included his sister) moved back to Denmark. Starrett had little to do with the last two issues, which were edited by his friend and fellow Chicago poet, Thomas Kennedy. The Wave had only eight issues, but it did produce one additional collectible. For Christmas 1922, the friends of Starrett, Hinrichsen and The Wave received a printed card produced by Hinrichsen Print of Chicago. Back to the Christmas card. "Ballad" offered by Huguenot has an 18th century feel, with its old style spellings, tavern setting and salty subject matter. It is transcribed at the end of this article. On the back of the card is a list of The Wave's entire staff. Starrett makes no mention of Triebel or Sahud in his memoirs. Perhaps, unilke Steen Hinrichsen, they did not have blond sisters. About 100 of these cards were printed, according to Charles Honce's book, A Vincent Starrett Library. The title page to next-to-last number of The Wave. Starrett says that while his name was listed as editor, he had little to do with the issue. Starrett’s view was that once Hinrichsen left for home, the magazine could not overcome the other problems. Where I am wellcom gest. And staye til alle be past? Are stockings silke and and (sic) new. Lest ye shall envye mee!